For many people Father’s Day is just another Hallmark Holiday where obligatory tribute is bestowed on the traditional head of the house, the analogue of Mother’s Day but six weeks later. Father’s Day for most of us is a day to celebrate or remember our father and to celebrate the privilege of fatherhood and family. There are many spins on this day, as some people never knew their father. For some, it is a painful day as their relationship with their father or children was absent, lacking or painful. I remember being in grade school and one of my buddies whose father passed away early, would feel very bad at school while the rest of us made coffee cups and paperweights for our fathers, he felt empty. For the average family this holiday will probably include some cards, phone calls, unwanted socks and ties and a picnic. It is largely a topical day that lacks the celebration of more prodigious holidays. For me personally this is a happy and a sad day. I am grateful that my father is 86 years old and still going strong. I will certainly call him in Ohio and wish him a happy day while at the same time fight back emotions that this ritual is limited. I think about the hard work ethic he instilled in me and the attribute to never quit, no matter what. I think about how he is a member of the greatest generation and after coming home from WWII became the first child of an immigrant family to obtain a college degree. I think about how hard he worked to raise four kids and what an example he set for me as a provider, protector, gentleman and humorist. Being the father of two profoundly disabled young sons certainly adds other layers of emotion to Father’s Day. Most men take for granted the lifelong dream of having a normal healthy son. Every father, before achieving that status, had thoughts of raising a namesake, teaching him how to fish or hunt or throw a ball or do the big and little things in life. It took me a while to find the girl of my dreams (I could write a great article about the importance of Mother’s Day) and my first son and namesake Joey was born in July of 2000. The first 3 months of fatherhood seemed normal but Joey began having seizures and missing milestones. He was diagnosed with severe cerebral palsy and we were told that he would never walk or talk or mentally develop. He had numerous gastrointestinal problems and went through several operations in his first years of life. Obviously, this was a huge emotional setback for all of us. I can’t tell you how helpless you feel as a parent to know that your child will never grow up, never experience a normal life, never progress. One of my primary concerns was who would take care of Joey if something were to happen to my wife or me. I wanted to have another child for many reasons. I wanted a family member who would always watch out for Joey so he would never end up in an institution. I also wanted to be a father to a healthy child and do what fathers and children do. We underwent significant genetic counseling, blood tests, etc. and were told that Joey’s condition was a genetic mutation in early pregnancy and that having another child with the same situation would be very rare. I was elated when my wife April became pregnant again. We underwent intense and high-risk neonatal care with amniocentesis and multiple ultrasounds. We found out that our second child was a healthy boy and we named him Evan. Evan would be my “savior”; he would be Joey’s protector in the future and the son that would experience the things that all fathers want to do. Evan appeared normal and healthy at birth, but he did not roll over or crawl and began missing milestones. The pattern was all too familiar; we had seen it with Joey. Our worst fears soon came true; Evan had the same syndrome Joey had. He began having severe G.I. problems and also required numerous operations. April and I spent so many weeks in the hospital or emergency room that it became a way of life. My wife is the strongest person I know and my sons are my soldiers. So, the reality of my life is that I have 8 and 10-year-old sons that are tube fed, will always be in diapers, will never walk or talk and will always be 100% dependant. It hurts to know this, it hurts to even write this, but it is my life. I will never hear the word “daddy” and will never get to experience the “normal” joys of fatherhood. I am a dedicated teacher and it hurts me that I cannot teach my sons about all the wonders of life and the human body and how things work. It hurts me that I cannot watch them learn or prosper. I will never see them make friends, go on a date, hit a homerun, go to the prom, or get a diploma. The reality of this, times two, is emotionally incapacitating. Any parent of a special needs child can relate. Any parent with a special needs child can attest to the difficulty in falling asleep at night due to the fear of the future and the perseverance to get through tomorrow. You worry about a lot of little things like who will carry on our family name, how will I move my sons when they get too heavy to lift? In reality these are not important, only getting through today is important. So what keeps us going? First of all, I am happy that my boys are alive as there have been some very dark days in the ICU where I was not sure if they were going to make it. There is also the reality that although our situation is bad, others have it much worse. I’m blessed that I can afford to keep my children at home and don’t have to institutionalize them, as that loss would be insurmountable. There are many families who cannot do this and there are many single mothers with special needs children that cannot afford ramps, handicapped vans, special equipment and around the clock nursing. I am grateful that I can. Our situation has also made us advocates for children and families with special needs. We can help others and make the world better by spreading the word and being proactive for those who cannot speak for themselves. Unfortunately, when state budgets get tight, the first things to go are social services and the most helpless get the short end of the stick. I have always been a champion for the less fortunate, but I now have an even bigger reason to do so. All parents love their children, but love for a special needs child transcends description. These children are entirely reliant on their caregivers and this special bond of love is so hard to put into words, but you can see it and you live it. My job is to make my sons laugh as much as possible and if I can get a smile before I leave for work and one when I get home, my day is complete. Compared to normal families, we live in a world of “different”. Our normal is different from your normal. Playing my guitar and making my boys smile and laugh is the same as a normal parent watching their son score a goal or get an “A” on a test. Another positive from this experience is the fact that it makes you reevaluate priorities in life. It makes you never take anything for granted; it makes you not sweat the small stuff. It has also given me tremendous resolve. It makes me sad when I see parents screaming or spanking their kids, if they could just spend a day at my house, they would view their children different. We take so much for granted, including having healthy children. I would urge readers of this article to never take a single second for granted, as life is a short and fragile thing. I would encourage all parents to savor every second and to kiss their children as much as possible. I would also want readers to understand that there are many families out there that are barely making it and they need help and advocacy. 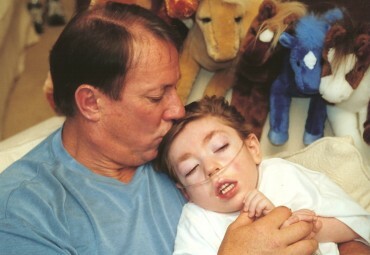 My good friend and Hall of Fame quarterback Jim Kelly had a special needs son who died at age eight. His wife Jill told me that if she had to do it all over again, she would. Hunter completely changed her life and the lives of so many others. In many ways, he made the world better. So, Father’s Day is different at our house and for that matter, every day is different at our house. There are enormous challenges but also enormous rewards. Rewards that are deep, pure and cherished; much the same as a normal family, but yet very different. If I can get a smile from Joey and Evan on Father’s Day, it will be a perfect holiday. Wow…I’m in awe right now of how God allows certain paths to cross at just the right time – for His glory. Not too long ago, I reconnected with a friend from Notre Dame High School through Twitter (@JimiJamm) – Frank Collins. Initially, I have to be honest, I was intimidated by the social media world. I was reluctant to jump into unfamiliar territory that appeared to be so “worldly”. But, I’m so thankful that I did. We are all in this together! Frank created this video – he introduced me to EMBER, the artists of this amazing song, THE DEEP END – and here we are – all in this together. I believe with all my heart that God is doing and will continue to do immeasurably more than all we could ever ask or imagine – because it’s about HIM. And when He is the focus – things happen – lives are changed – we act like family instead of a bunch of strangers. I’ll be there soon little buddy! This video is for all of you – my dear friends – the grieving – the broken – hurting strangers – the lost – the lonely – the hopeful – the hopeless – the hurting – the sinner and the saint. God has prepared a place for you – do you believe this? When all is said and done here…you will know this. The very details of your life – from the family to which you’ve been born into, the number of hairs on your head, the home in which you lay your head down at night – ALL the details of your life have been orchestrated around ONE thing – that YOU would seek after GOD and find HIM. This is good news – no this is great news – in fact this means everything. If there’s one thing that my beloved son, Hunter taught me, it’s this – life is short but love endures forever! I’ll be there soon little buddy…I’ll be there soon! Wow, talk about a whirlwind of excitement! My first book, Prayers for Those Who Grieve arrived unexpectedly yesterday afternoon. If he hadn’t already walked away from our front door, I probably would have hugged the UPS man. 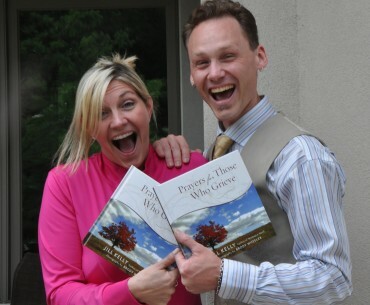 The anticipation for the release of this prayer book has been overwhelming. When I finally held Prayers for Those Who Grieve for the very first time, after months of waiting, I didn’t know what to say —or how to feel. I felt like I was being held and hugged by the God who made it all possible. However, wrapped up in the midst of all this excitement was a longing, broken heart —my broken heart. God had a plan for our pain and Hunter’s suffering. And although I don’t understand the fullness of why God chose to allow Hunter, our one and only son, to be a silent beckon of healing and hope in the midst of great suffering, I choose to trust Him. His peace beyond understanding and unspeakable joy has rescued our family. God Himself rescued me and without Him, I would have no hope. There would be no prayer book for the grieving heart—nothing would matter. Only because God, in His goodness and faithfulness, had determined to turn my ashes into beauty, my mourning into dancing, and my weeping into laughter, am I able to celebrate and rejoice. I can run to Him with my tears, in brokenness and frailty, because He is always waiting for me with open arms. There will be a day that dawns with no more tears, mourning, pain, or sorrow. He will fulfill His promises. Though I long for that day, I suppose that Prayers for Those Who Grieve is in part, fulfillment of some of the promises He has made. This book is evidence that what the enemy may mean for evil, God will use for good (Genesis 50:20). I believe with all my heart that God wants to turn your tears into a beautiful offering of encouragement. Someone in your life needs to know that there is hope. Someone needs the kind of hug that only you can give because you’ve been there and you know. Maybe, you’re the one who is broken, hurting and desperate—stop what you’re doing and run to Jesus! I’m not kidding! Had I not turned to Him in my darkest hour, I would not be here right now, I would not have survived the depth of despair I was drowning in. He’s ready and willing to rescue you, with open arms He longs to bring you comfort. Will you give God your pain? Will you trust Him with your tears? P.S. I just want to thank you for being a part of this journey with me. I appreciate you more than words can say.